I had no idea fried cauliflower could ever make a fantastic sandwich. Ok honestly, I had no idea cauliflower would go well in a sandwich at all. Ah, but now I know, and my life (or taste buds) have changed for the better. Though now I want one of these babies all the time and I’m not sure how healthy all that fried cauliflower will be in the long run. Crusing through New York’s own Serious Eats a few weeks back I came across a fried cauliflower sandwich from Rainbow Falafel & Shawarm. They thought it deserved some love and so did I, but with no recipe provided, I had to make up one of my own. The fried cauliflower part comes from Food.com. The rest I threw together as a compliment for those tasty tender breaded veggies. Rainbow Falafel & Shawarm uses a tahini sauce on their sandwiches, but I thought lemon-garlic would go well here. Warm the tortillas in the microwave between two napkins. Place one tortilla on a plate and top with cauliflower, lettuce, tomato slices, onion slivers, salt and pepper. Drizzle with the mayo. Fold up bottom and roll into a burrito. Repeat with remaining tortillas. Mix all the ingredients together. Chill until ready to use. 1. Preheat fryer oil to 375. 2. Place the beaten eggs, milk and salt in a shallow bowl (or a large baggie). 3. In a separate shallow bowl (or another large baggie), mix together flour, cheese, garlic powder, thyme, oregano, paprika, cayenne, and pepper. 4. Place florets into egg mixture and toss (or shake baggie) to coat well. 5. Remove and place into flour mixture and toss (or shake baggie) to coat well. 6. Fry in batches for 4 - 6 minutes or until golden brown. 7. Drain on paper towels and lightly salt. Deep Fried Cauliflower recipe by Margie99 from Food.com. Lemon Garlic Mayonnaise, pita recipe and photographs by Laura Flowers. I'm afraid the fried cauliflower would never make it into the wraps! The garlic mayo sounds fabulous as well. As soon as I saw fried cauliflower....I thought that would be a great sandwich-the lemon garlic mayo is a really nice addition. Pretty much, fried anything sounds good to me:) The lemon garlic mayo sounds out of this world! Have a great week, Laura. 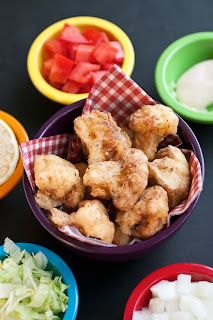 Fried cauliflower! Sounds delicious! And the lemon garlic mayo sounds super refreshing and delicious. I can't wait to try this one - what an original sandwich wrap! Thanks for sharing! Oh Laura - Your cheery and colorful photo brightened my day. Please come and cook for me. This looks amazing! I definitely need to try this. Let's make a deal. I am going to take a trip down to Rainbow Falafel and Shawarma. And I am going to sample this fried cauliflower sandwich. And I shall report back. The end. And if it's really truly everything I think you dreamed it would be...then when you come to NYC, we shall go there. End of story. Although your version looks pretty damn amazing. So I'll of course have to test drive it first. For comparison's sake. WOW. I don't even like cauliflower and I would down this! I'm really curious to try deep fried cauliflower now. I love your food tastes! This is soooo something I would love. I hope I remember to try it. 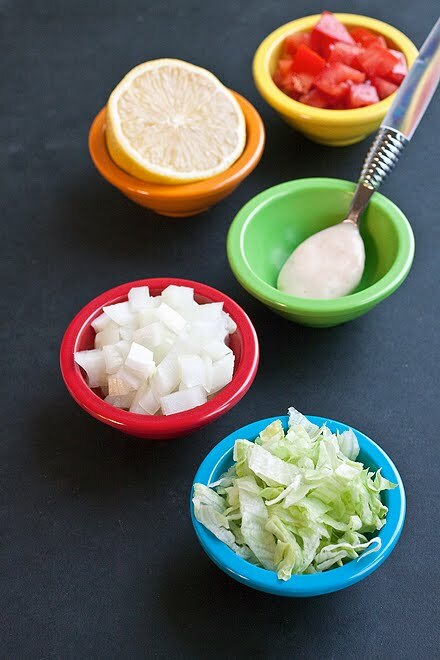 The mayo reminds me of the lemon dipping sauce for the artichokes you posted a long time ago. I finally finally tried that by the way, and it was SO SCRUMPTIOUS! You were absolutely right and I'm so glad I remembered it when I bought my first fresh artichoke on a whim and was wondering what to do with it. I wasn't thrilled with the artichoke by itself but ANYTHING would have been good in that sauce and I was sad when both ran out. I've never even thought of fried cauliflower by itself, let alone a sandwich! Definitely going to be trying this out very soon though! I am not a cauliflower fan but now I am craving this yummy wrap. I love the lemon garlic mayo recipe. Never would have thought they were fried cauliflower. Yum! I bet they are crispy and creamy wonderful. 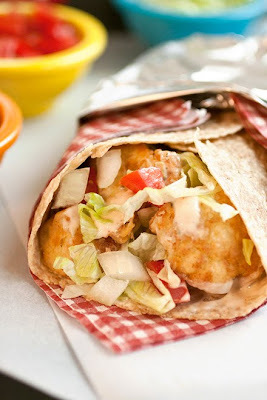 Well how smart is this wrap, deep fried cauliflower, so different, can't wait to try. I am thinking of even just the deep fried cauliflower, nice idea. These look insane! With the lemon mayo? Oh yeah! Can't wait to try! Nice work! Cauliflower is finally getting some love! Seriously I never would have thought of that! I bet it was soooo good...and hey...it's still a vegetable even if it is fried right?! I've never seen a wrap like this and it sounds amazing, Laura! I just tried cauliflower "steaks" for the first time and those were yummy too! wow! deep fried cauliflower sounds divine!